Rarely has such a short time produced such a dramatic change in the retail scene. A 2018 article in The New York Times includes the shocking statement that “a survey conducted by Douglas Elliman found that about 20 percent of all retail space in Manhattan is currently vacant…compared with roughly 7 percent in 2016.” This comes at a time when tourism and the general economy in New York are doing well. The factors contributing to this decline in brick and mortar retail in the Big Apple are in part unique to New York, with its extremely high rents and the “warehousing” of storefronts by landlords able to hold out for large businesses willing to pay top dollar. But other factors, such as paralyzing competition from online shopping, are common to small-town America as well as Manhattan. What can be done? There is a movement to make sure that store windows are kept clean and filled with bright, uplifting messages even if the building is vacant. Non-profit groups and other retailers can make good use of the space to share a message with the public, or to display art work. And although landlords will have to cooperate to make this happen, they are much more likely to be able to rent a vacant property in an area that does not appear blighted. There can also be a concerted effort by communities to support new retailers. One of the reasons for vacancies cited in The New York Times article is the lack of entrepreneurs wanting to open a shop. This is in part because it is extremely difficult to get a traditional small business loan today. Perhaps angel investors can be encouraged to help new retailers get off the ground for the sake of the community. One creative landlord in Buffalo, NY took a positive approach, as shown in the illustration to today’s blog from The Buffalo News. Instead of just posting a “for rent” sign, the owner polled passersby with a sign, “What should go here?” Engaging potential customers, and neighborhood associations, in the search for new businesses is a positive step. Some cities have chosen to enact penalties on landlords who keep properties vacant for extended periods of time. 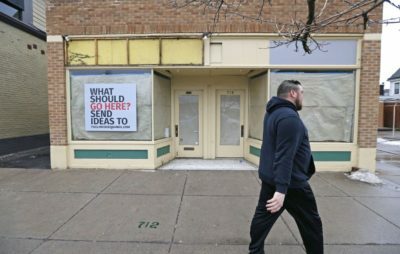 Arlington, Massachusetts enacted a fine for empty storefronts in 2017, giving property owners a financial incentive to actively seek new tenants. The concept of a vacancy tax is controversial, but it is one of the options available at the government level to decrease empty storefronts. There is no doubt that this is a challenging era for retailers. Many of us have come through bad times in the past, and we will get through this one too. But we need to engage our community leaders and our local government in the fight to maintain a viable retail environment – empty storefronts represent a lost opportunity for us all.